Bird themed decoration is hot news in the world of home decor, and incorporating it into your table decorations means that you can update the look really easily. There are many ways to achieve the look, from using wreaths on the table and altering them to your needs, create some natural but fun table centerpieces, or just add the odd finishing touch. Any good table decor plan starts with the centerpiece, and there are many options when it comes to bird themed decor for the table. The wreath style of centerpiece works especially well with the bird theme, and there are many variations on this to try. 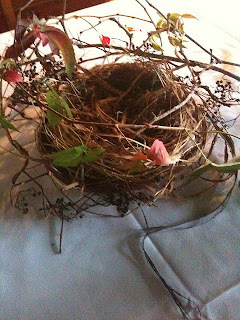 An authentic, and indeed unique table wreath, can be made by decorating with branches and twigs to create a bird nest. You are then free to decorate this wreath as you wish. Add a simple bird ornament (you could always make your own from polymer clay), to make the bird nest wreath its home. You can add further details such as small eggs, and even wire a mushroom bird to the wreath. The eggs could be made of anything from polymer clay, or even plastic ones from a craft shop, chocolate ones, or the real thing. 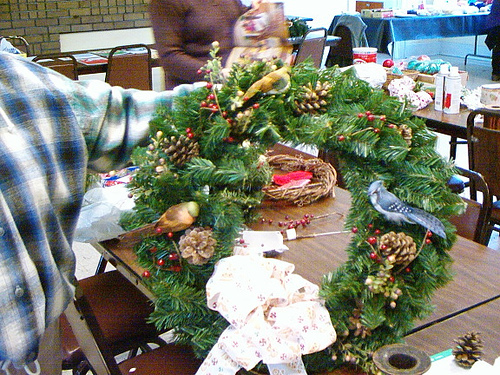 The wreath pictured here has also made use of other natural materials available at the time. This obviously depends on the season, but lengths of ivy and grapevine always work well. Pine twigs and pine cones have been used here but feathers or even berries could be used. Adding cherry blossom, or any small flowers in purple and yellow, would be perfect for a spring table decoration. 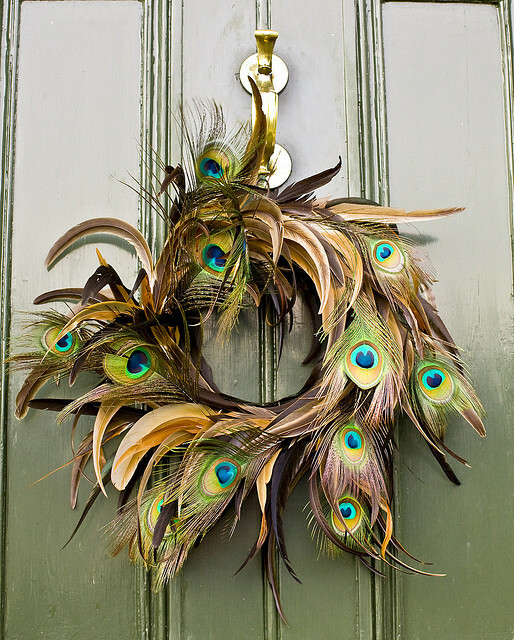 Or try making a wreath from feathers. Many feathers work well, but large types, like peacock feathers, definitely add a certain grandness to the table. You could also use the wreath idea, to merely frame your main centerpiece, or use a large shallow dish with egg shaped candles in, and the wreath around the outside. Another centerpiece idea you could try is using an ornamental bird cage. You can buy these from craft stores, or try tracking down pre-owned ones that you can clean up and spray paint according to your decor. Simply use these as they are, and drape them in some greenery or fairy lights, or use them to display a more traditional floral centerpiece inside. In table decor treat your tablecloth like a photo treats a frame -- it should be attractive, but not the star of the show, its job is to show off the decorations to the best advantage. A white tablecloth will always be a winner, but you can change this according to the season, or match it up to one of the colors in your centerpiece. Add more detail to your tablecloth by introducing some bird motifs. You can either buy ready-made appliqué pieces, make your own, or else use an iron on T-shirt transfer. There are plenty of free images to be found on the Internet; simply save them to your computer and then print out using a transfer sheet - iron on the motifs to your tablecloth wherever you wish. Continue the theme of your centerpiece, through to the table place settings. Mini bird nests make attractive place card holders, or indeed holders of chocolate eggs to keep all guests happy. If you want something a little bit different at mealtimes, why not use a birdhouse or nesting box as a napkin dispenser. Leave rustic and wooden, or paint up to match the rest of the table decor. Of course, there are many other small ways that you can incorporate bird decor to your table. There are many bird images around at the moment, thanks to it being one of the popular decorating trends. You could try using a sample of wallpaper featuring birds as a runner down the center of the table, or as a mat to put bowls, etc., onto. There are numerous modern and vintage plates and pots that feature bird motifs, and a metal trivet with a bird design in the middle would be a good option too. 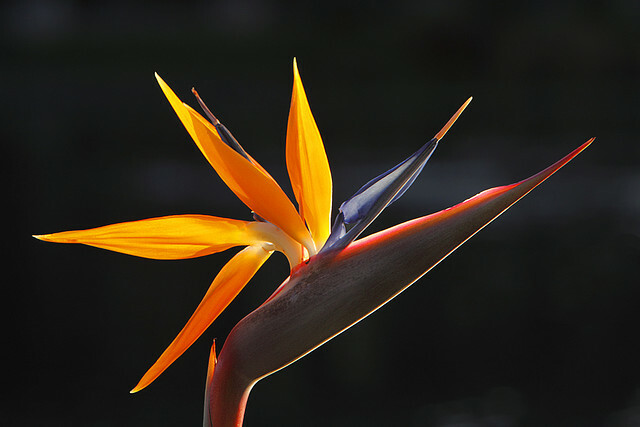 Of course, for an instant bird theme table decoration why not just use a bunch of "bird of paradise" flowers in a tall vase, for an abstract bird decor idea, or incorporate them into any of our table centerpiece ideas above. 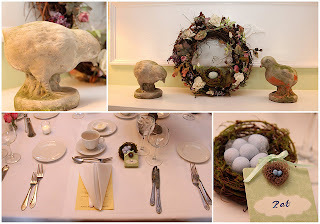 Bird themed table decor doesn't have to mean bird ornaments all over the table. The ideas here will give you many options to make the decor of your table just sing.